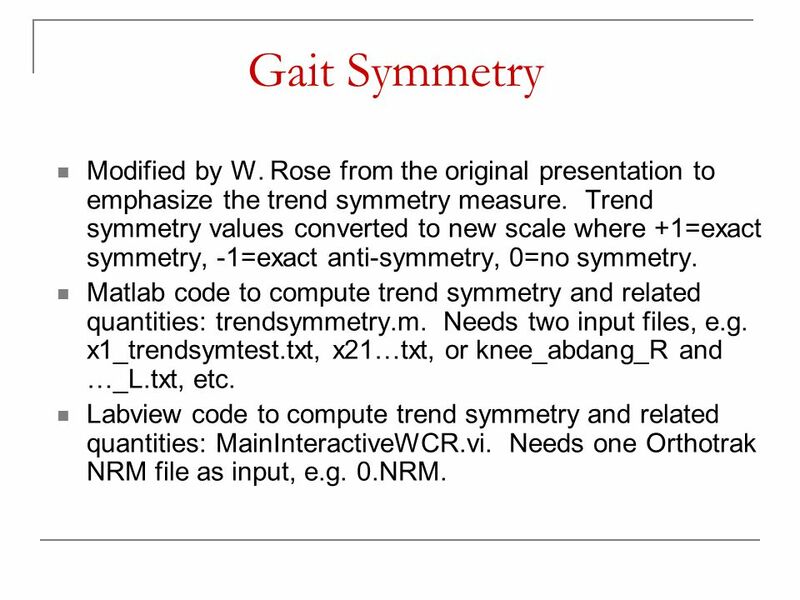 2 Gait Symmetry Modified by W. Rose from the original presentation to emphasize the trend symmetry measure. 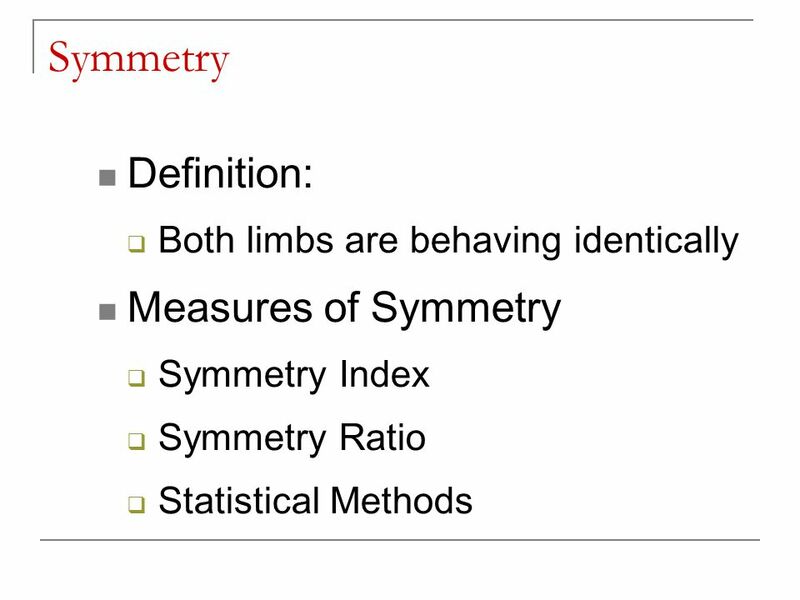 Trend symmetry values converted to new scale where +1=exact symmetry, -1=exact anti-symmetry, 0=no symmetry. 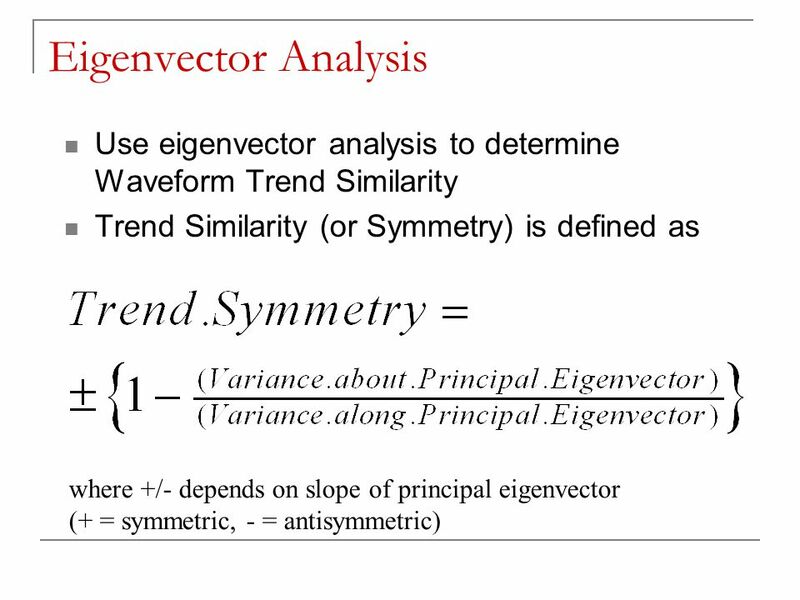 Matlab code to compute trend symmetry and related quantities: trendsymmetry.m. Needs two input files, e.g. x1_trendsymtest.txt, x21…txt, or knee_abdang_R and …_L.txt, etc. 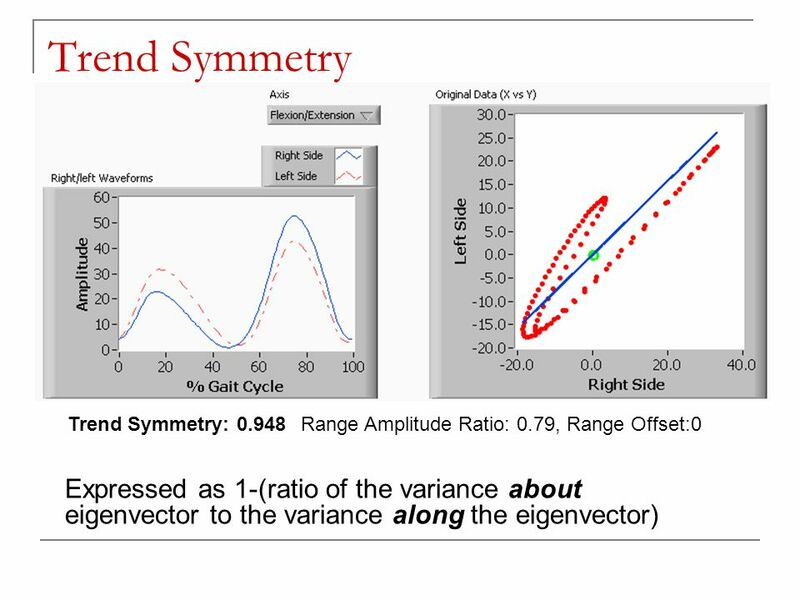 Labview code to compute trend symmetry and related quantities: MainInteractiveWCR.vi. Needs one Orthotrak NRM file as input, e.g. 0.NRM. 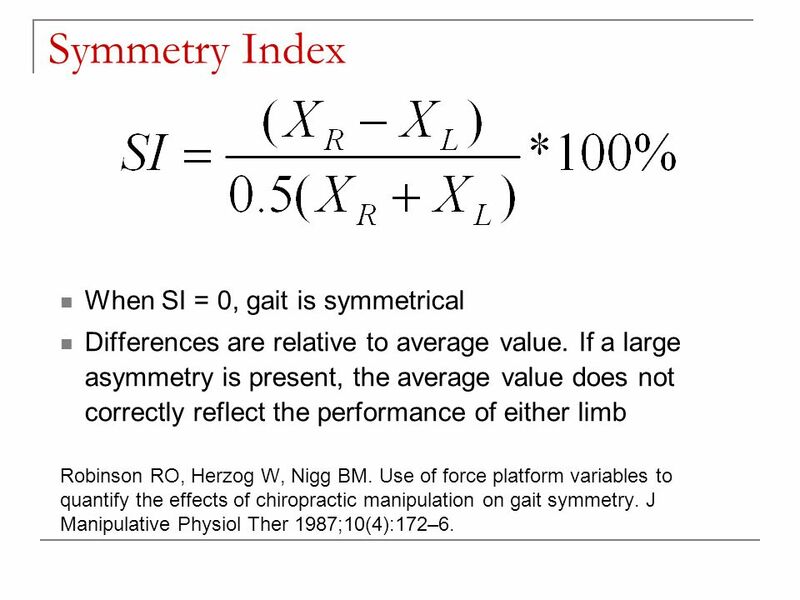 5 Symmetry Index When SI = 0, gait is symmetrical Differences are relative to average value. 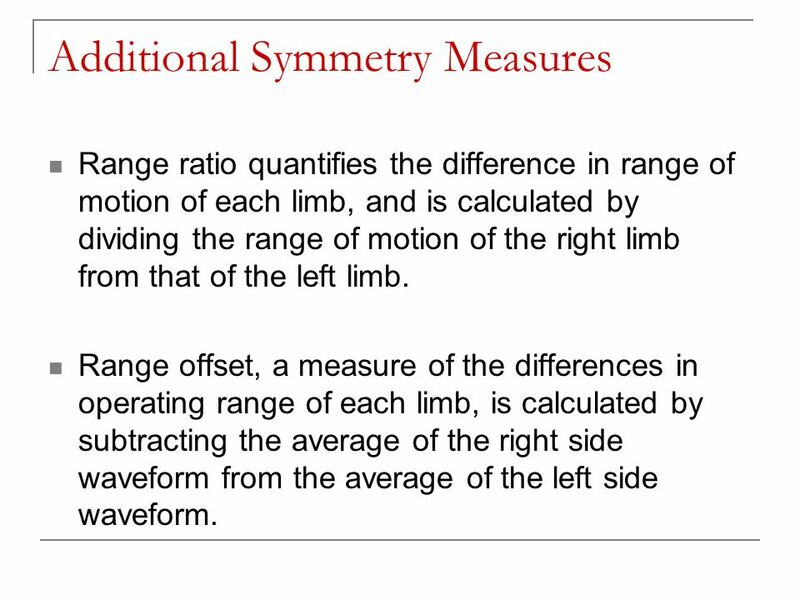 If a large asymmetry is present, the average value does not correctly reflect the performance of either limb Robinson RO, Herzog W, Nigg BM. 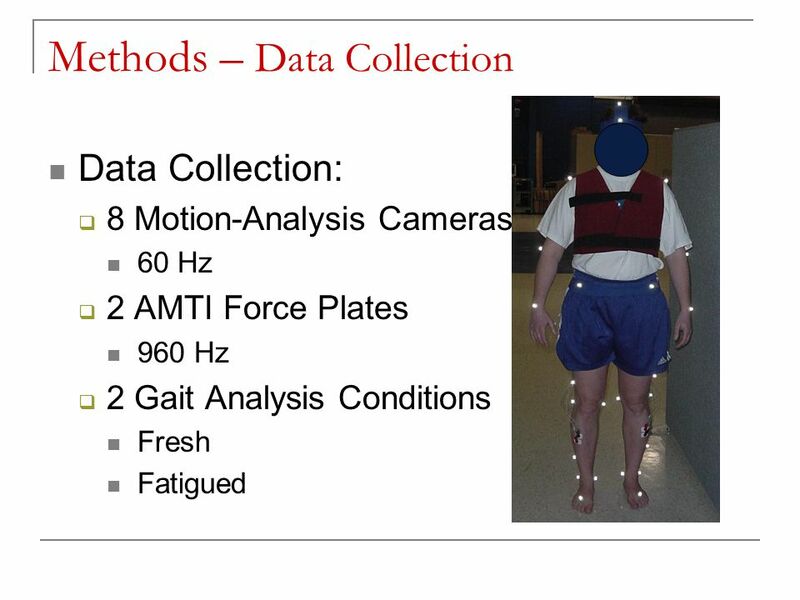 Use of force platform variables to quantify the effects of chiropractic manipulation on gait symmetry. J Manipulative Physiol Ther 1987;10(4):172–6. 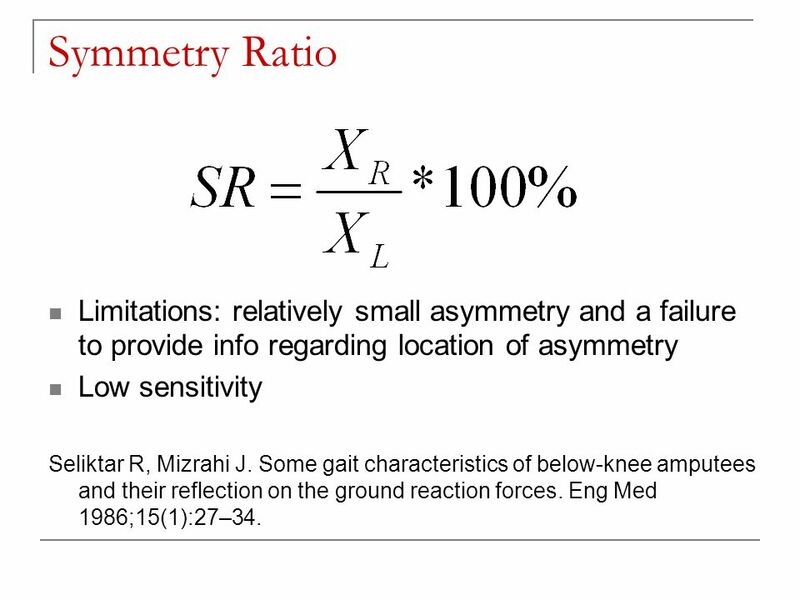 6 Symmetry Ratio Limitations: relatively small asymmetry and a failure to provide info regarding location of asymmetry Low sensitivity Seliktar R, Mizrahi J. 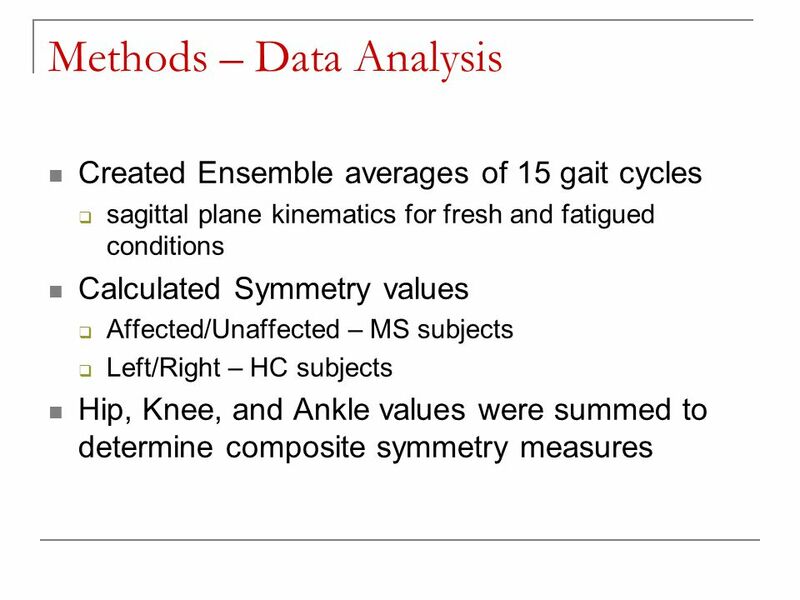 Some gait characteristics of below-knee amputees and their reflection on the ground reaction forces. Eng Med 1986;15(1):27–34. 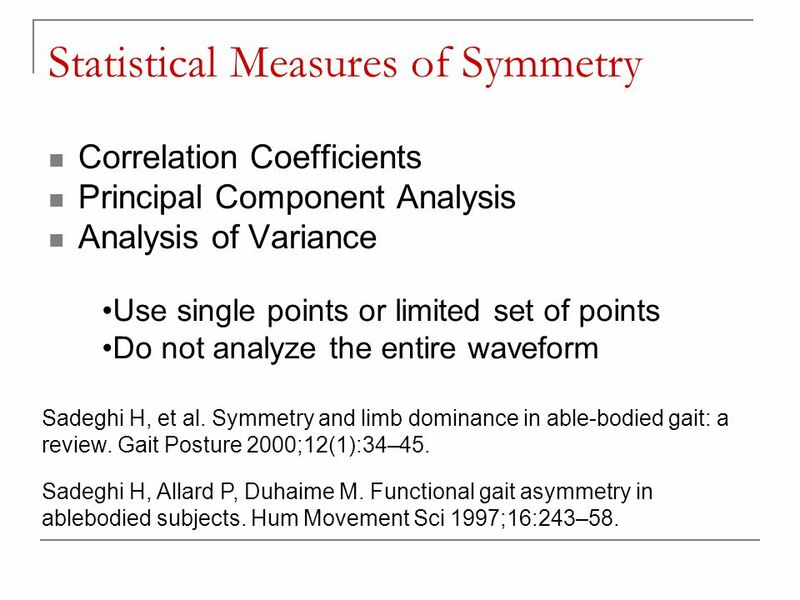 7 Statistical Measures of Symmetry Correlation Coefficients Principal Component Analysis Analysis of Variance Use single points or limited set of points Do not analyze the entire waveform Sadeghi H, et al. 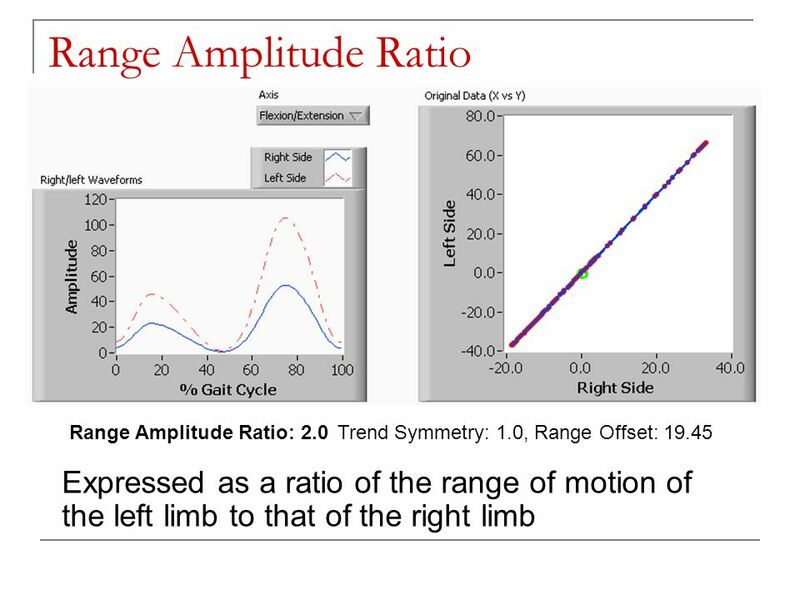 Symmetry and limb dominance in able-bodied gait: a review. Gait Posture 2000;12(1):34–45. 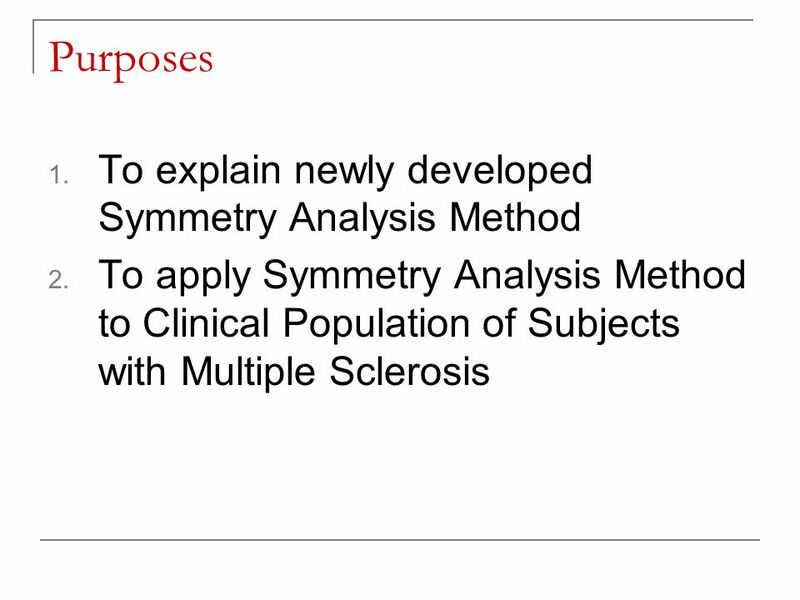 Sadeghi H, Allard P, Duhaime M. Functional gait asymmetry in ablebodied subjects. Hum Movement Sci 1997;16:243–58. 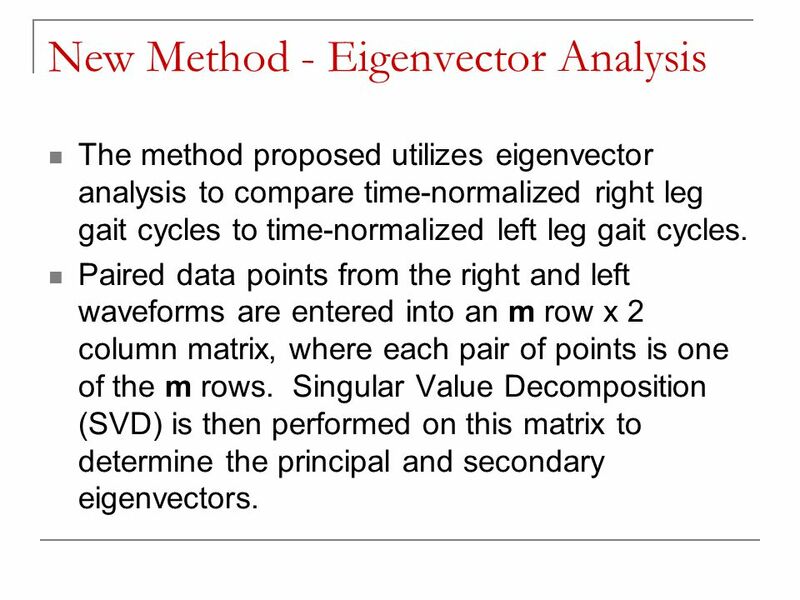 8 New Method - Eigenvector Analysis The method proposed utilizes eigenvector analysis to compare time-normalized right leg gait cycles to time-normalized left leg gait cycles. Paired data points from the right and left waveforms are entered into an m row x 2 column matrix, where each pair of points is one of the m rows. Singular Value Decomposition (SVD) is then performed on this matrix to determine the principal and secondary eigenvectors. 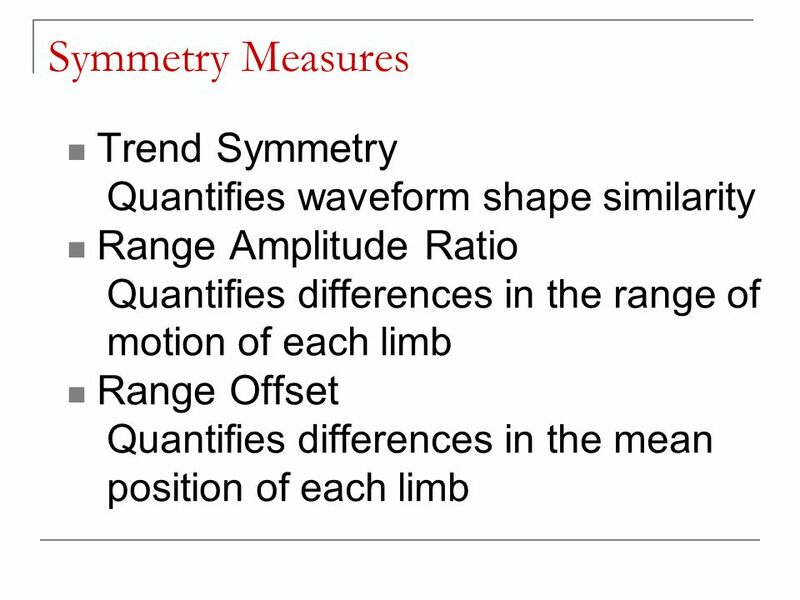 10 Additional Symmetry Measures Range ratio quantifies the difference in range of motion of each limb, and is calculated by dividing the range of motion of the right limb from that of the left limb. 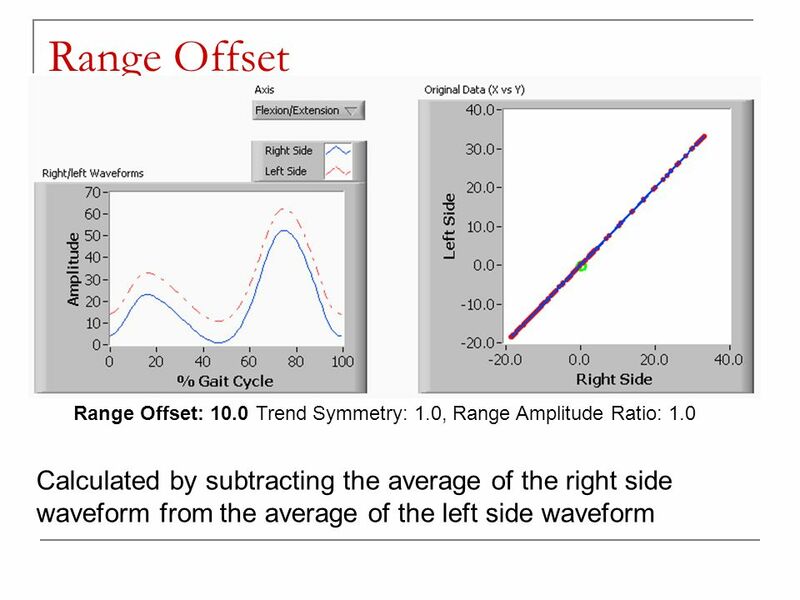 Range offset, a measure of the differences in operating range of each limb, is calculated by subtracting the average of the right side waveform from the average of the left side waveform. 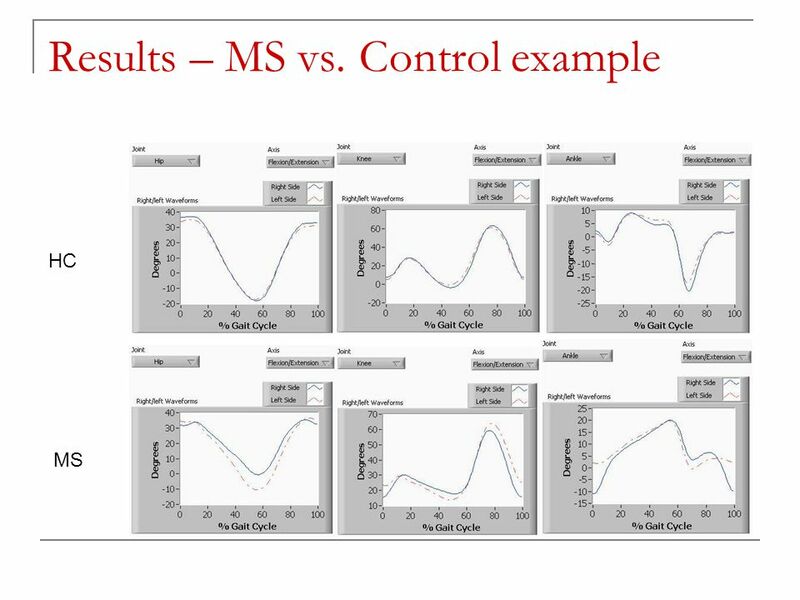 14 Final Adjustments Trend similarity can be used to estimate the phase relationship between waveforms. Phase-shift one waveform in 1-percent increments (e.g. 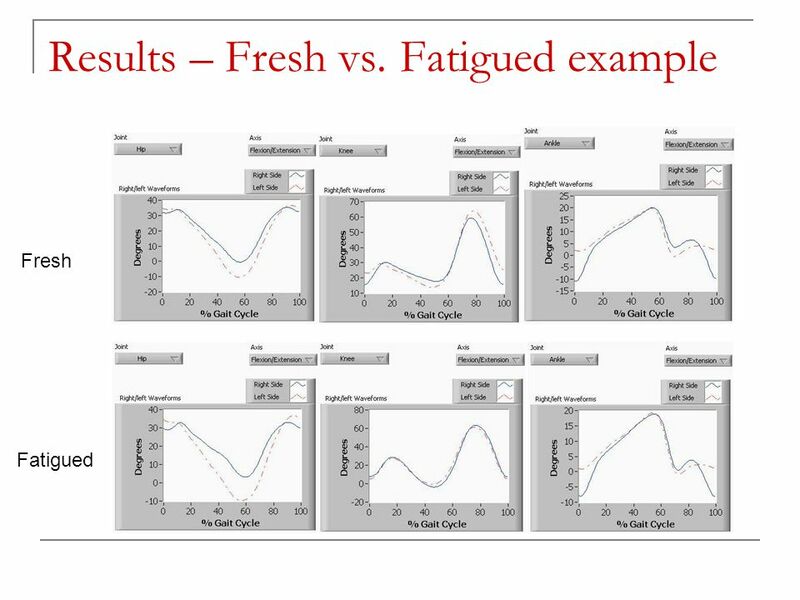 sample 100 becomes sample 1, sample 1 becomes sample 2…), up to a max shift of +-20%. Compute trend similarity at each phase shift. 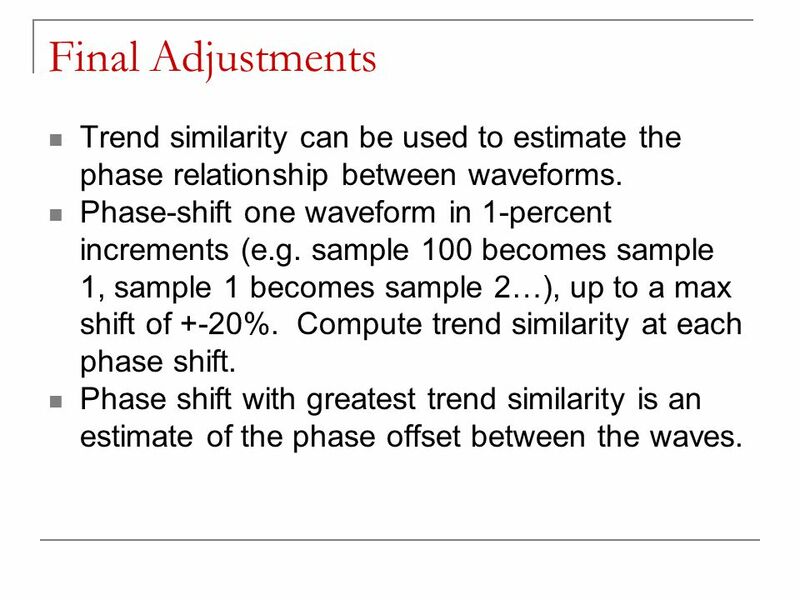 Phase shift with greatest trend similarity is an estimate of the phase offset between the waves. 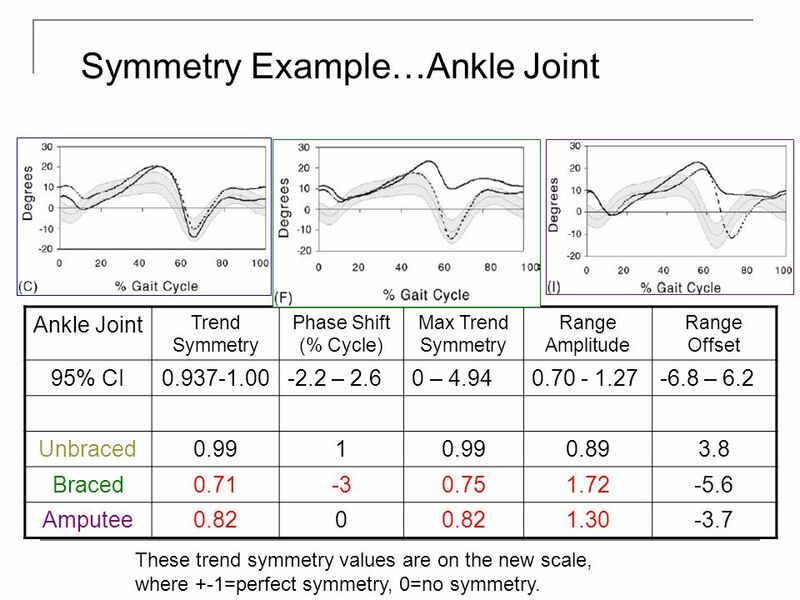 16 Ankle Joint Trend Symmetry Phase Shift (% Cycle) Max Trend Symmetry Range Amplitude Range Offset 95% CI0.937-1.00-2.2 – 2.60 – 4.940.70 - 1.27-6.8 – 6.2 Unbraced0.991 0.893.8 Braced0.71-30.751.72-5.6 Amputee0.820 1.30-3.7 Symmetry Example…Ankle Joint These trend symmetry values are on the new scale, where +-1=perfect symmetry, 0=no symmetry. 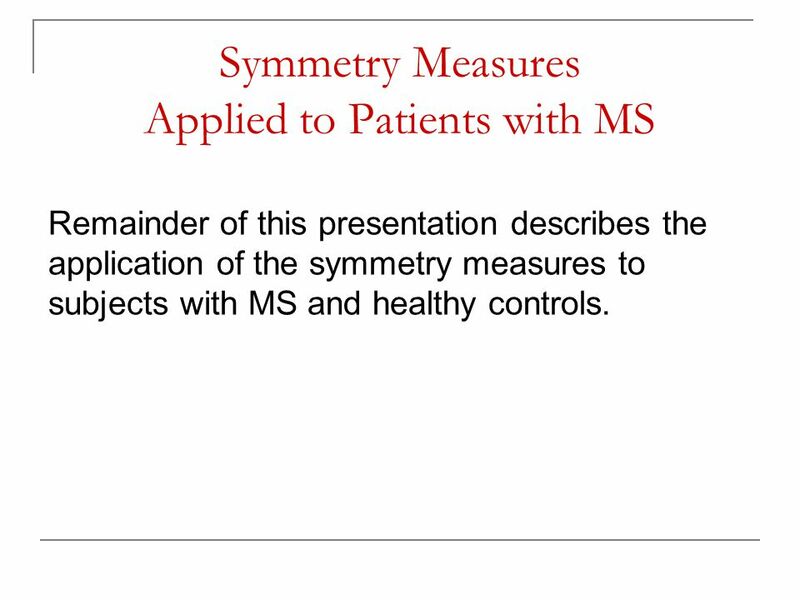 17 Symmetry Measures Applied to Patients with MS Remainder of this presentation describes the application of the symmetry measures to subjects with MS and healthy controls. 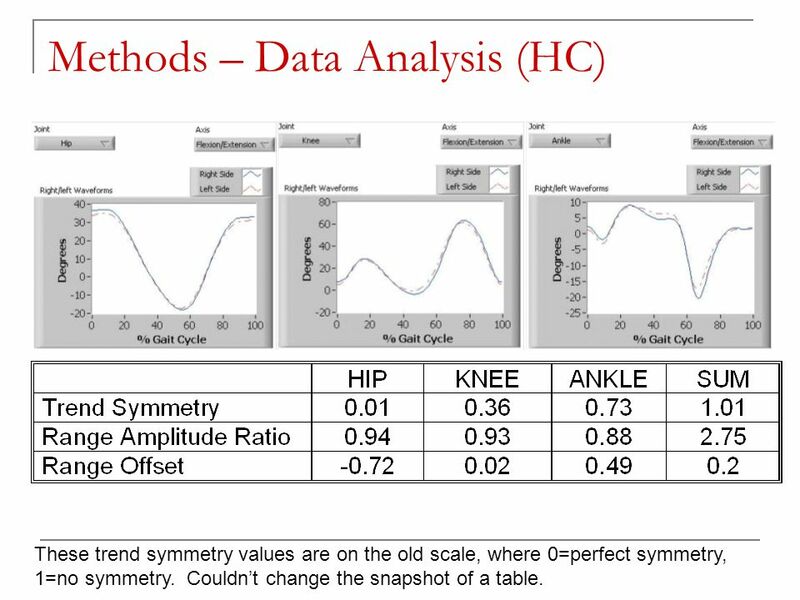 21 Methods – Data Analysis (HC) These trend symmetry values are on the old scale, where 0=perfect symmetry, 1=no symmetry. Couldn’t change the snapshot of a table. 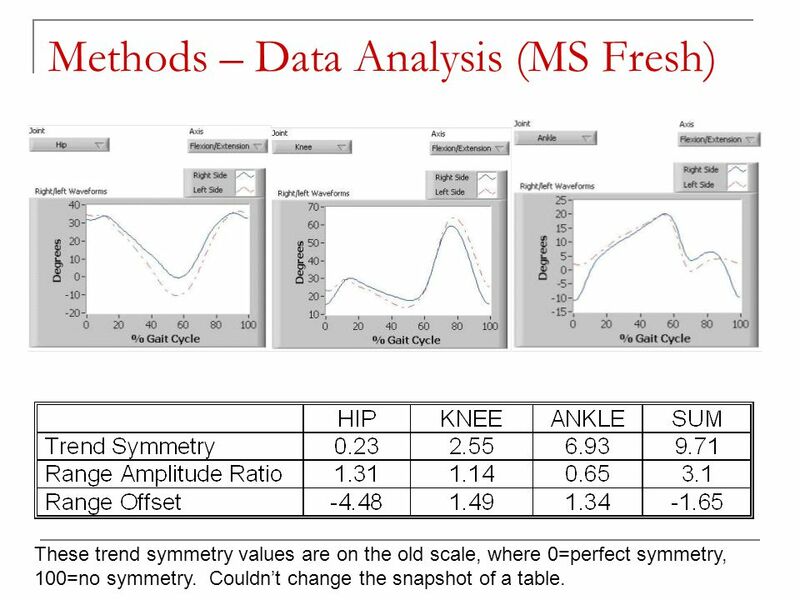 22 Methods – Data Analysis (MS Fresh) These trend symmetry values are on the old scale, where 0=perfect symmetry, 100=no symmetry. Couldn’t change the snapshot of a table. 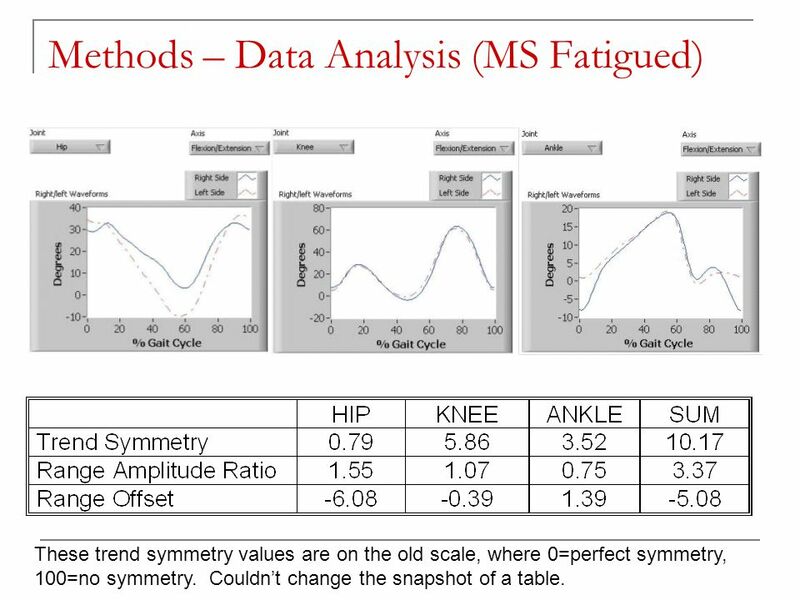 23 Methods – Data Analysis (MS Fatigued) These trend symmetry values are on the old scale, where 0=perfect symmetry, 100=no symmetry. Couldn’t change the snapshot of a table. 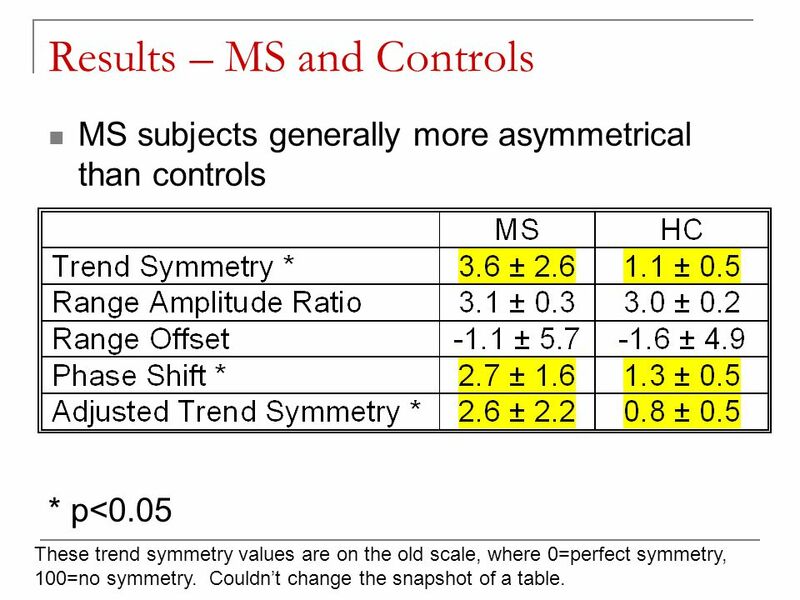 25 Results – MS and Controls MS subjects generally more asymmetrical than controls * p<0.05 These trend symmetry values are on the old scale, where 0=perfect symmetry, 100=no symmetry. Couldn’t change the snapshot of a table. 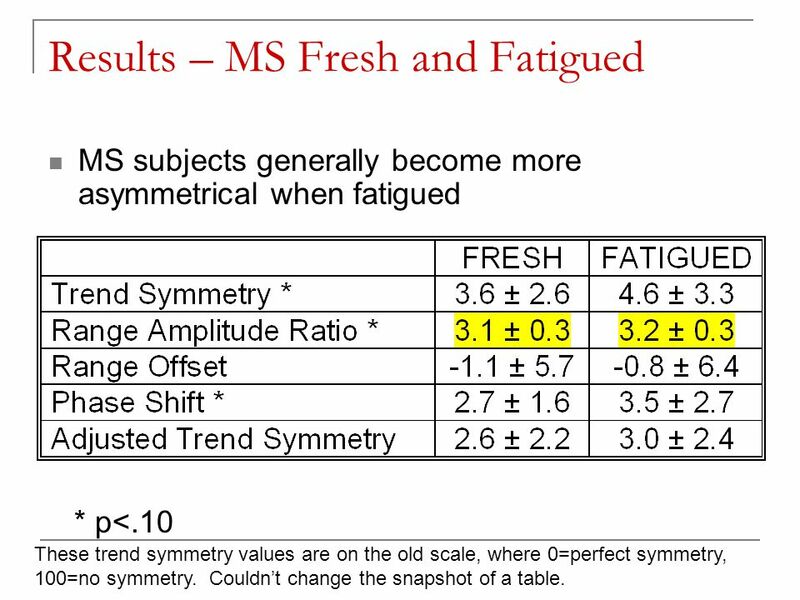 27 Results – MS Fresh and Fatigued MS subjects generally become more asymmetrical when fatigued * p<.10 These trend symmetry values are on the old scale, where 0=perfect symmetry, 100=no symmetry. Couldn’t change the snapshot of a table. 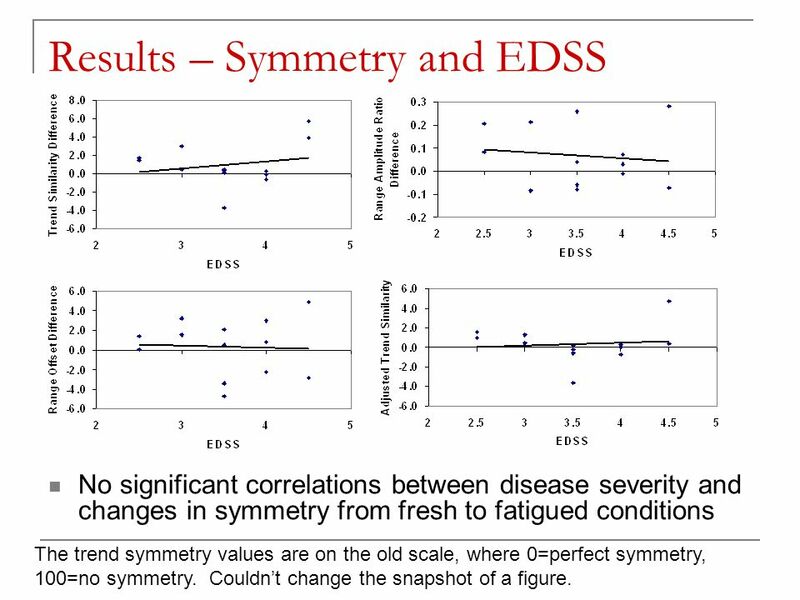 28 Results – Symmetry and EDSS No significant correlations between disease severity and changes in symmetry from fresh to fatigued conditions The trend symmetry values are on the old scale, where 0=perfect symmetry, 100=no symmetry. Couldn’t change the snapshot of a figure. 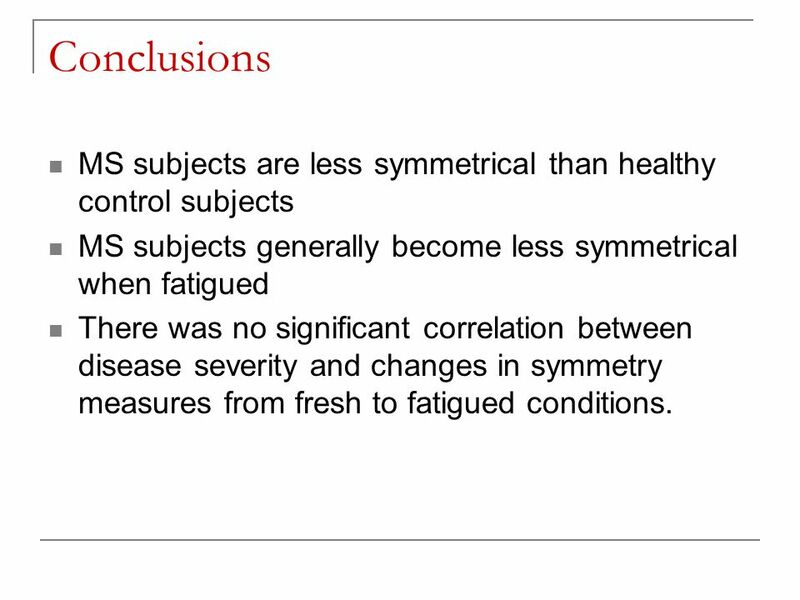 29 Conclusions MS subjects are less symmetrical than healthy control subjects MS subjects generally become less symmetrical when fatigued There was no significant correlation between disease severity and changes in symmetry measures from fresh to fatigued conditions. 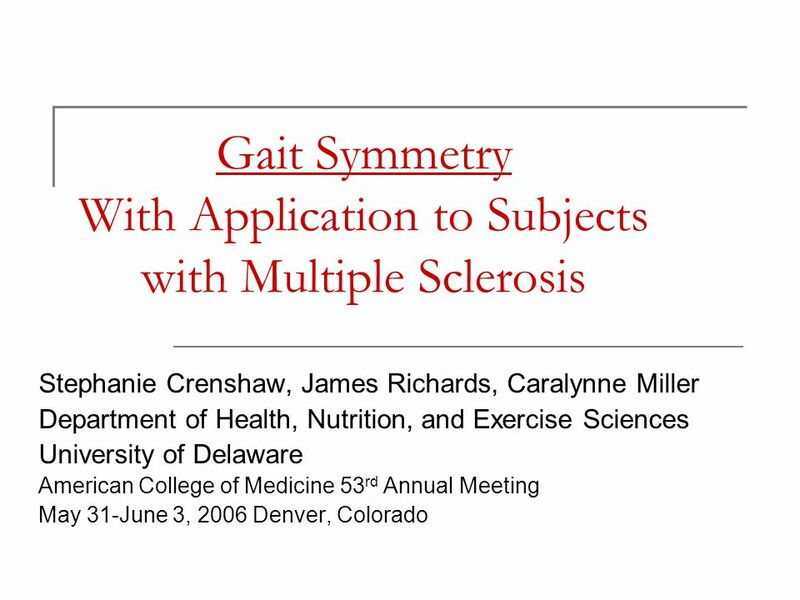 Download ppt "Gait Symmetry With Application to Subjects with Multiple Sclerosis Stephanie Crenshaw, James Richards, Caralynne Miller Department of Health, Nutrition,"
TEA Systems Corp. Confidential LithoWorks PEB On-Wafer analysis of two wafers August 8, 2003 Thermal analysis of two PEB plates: _peb_bake7.csv _peb_bake8.csv. 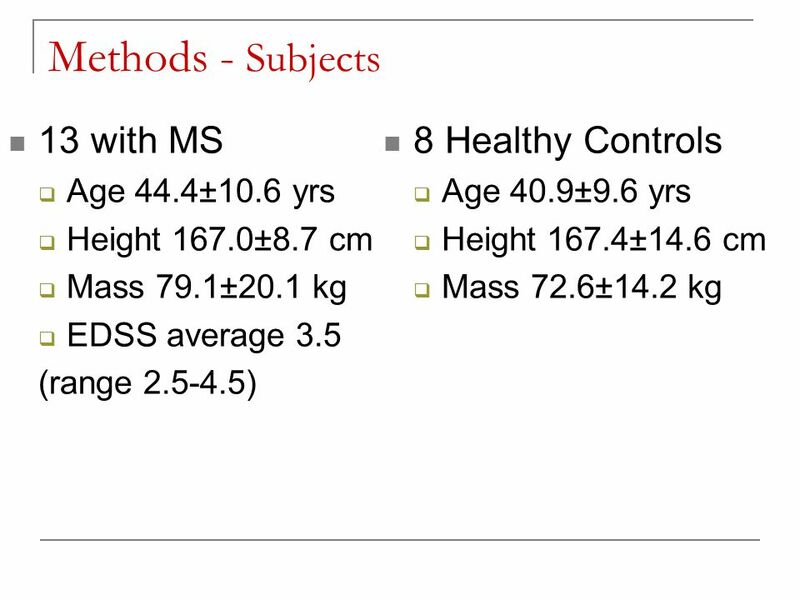 STATISTICS HYPOTHESES TEST (II) One-sample tests on the mean and variance Professor Ke-Sheng Cheng Department of Bioenvironmental Systems Engineering National. Order the numbers and find the middle value. 1 Contact details Colin Gray Room S16 (occasionally) address: Telephone: (27) 2233 Dont hesitate to get in touch. 1 Percentage: A commonly used relative quantity..